64% of voters say the press has done more to divide, compared to 56% who said the same about Trump. Plurality of Democrats say the press divides, along with eight in 10 Republicans. President Donald Trump’s combative relationship with the national news media has been a staple of his White House tenure, perhaps reaching a fever pitch in the wake of recent acts of anti-Semitic violence and attempted domestic terrorism. Days after authorities discovered a string of pipe bombs addressed to prominent Democratic politicians, donors and anti-Trump celebrities and after a gunman took 11 lives during a shooting at a synagogue in Pittsburgh, the president suggested that “The Fake News Media, the true Enemy of the People,” was to blame for the division in the country. “There is great anger in our Country caused in part by inaccurate, and even fraudulent, reporting of the news,” he said Monday on Twitter. To a certain extent, a new Morning Consult/Politico survey suggests Trump’s criticism rang true for roughly two-thirds of Americans, although it shows a majority also says he has been a mostly divisive presence. In the new Morning Consult/Politico poll, 64 percent of registered voters said the press has done more to divide the country than unite it since Trump took office, compared with 56 percent who said the same was true of the president. The poll of 2,543 voters was conducted Oct. 25-30, after news first broke of mail bomb suspect Cesar Sayoc’s attempted acts of politically motivated violence and amid news of a shooting by suspect Robert Bowers at the Tree of Life Synagogue in Pittsburgh. 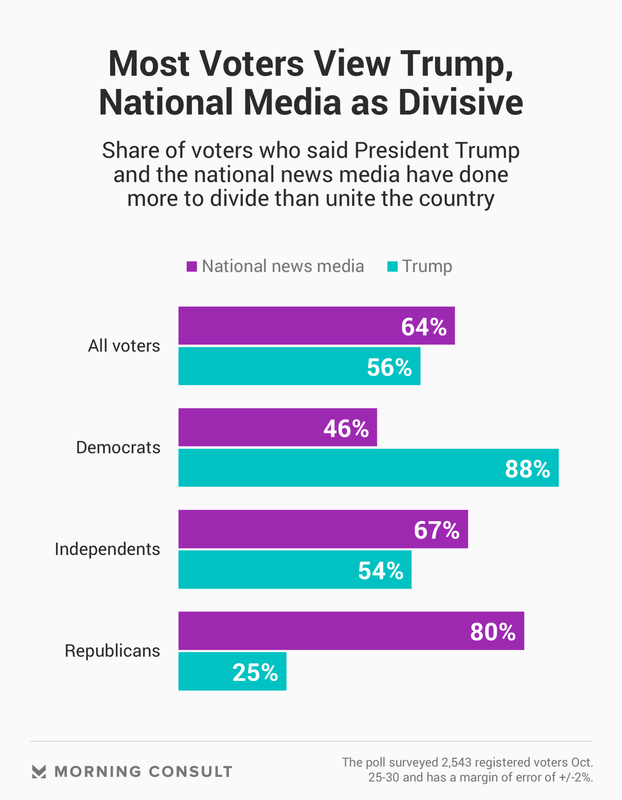 The view that the national news media has been a mostly divisive presence was shared among partisans: A plurality of Democrats (46 percent) said the national media has done more to divide than unite — about half the share of Democrats (88 percent) who said the same of Trump. Eight in 10 Republicans agree that the media has done more to divide, while a quarter of Republicans said Trump has been mostly divisive. A Morning Consult/Politico poll in July found that 28 percent of voters said they had “a lot” of confidence in the presidency — more than twice the 13 percent who said the same of television news and double the 14 percent who said the same of newspapers. Karlyn Bowman, who studies public opinion at the conservative American Enterprise Institute, said general views of the national media overall — despite polarized views about outlets viewed as partisan — have been declining sharply. When it comes to the media’s involvement in political division, one theory — detailed in a 2013 paper by Matthew Levendusky of the University of Pennsylvania and Neil Malhotra of Stanford — suggests that press coverage of polarization leads people to overestimate its actual degree, leading to a phenomenon among moderates of antipathy toward partisans and more intensity in opposition to the other side among shrewder partisans. But more than that, he said much of the rest of the press has fallen victim to looking at all of the news through the prism of Trump, a divisive figure in his own right, and in participating in the rat race — like jumping on Tuesday’s news about Trump’s comments on birthright citizenship. “The press themselves have become a tribe, as opposed to a foundational source of information. They’re viewed as much as a political player as advocate groups or partisan interests are,” he said.